The purposes of Richard J Bernstein’s Ironic Life are several. First, Bernstein finds it puzzling that, for the most part, the philosophical tradition has had little interest in thinking through the concept of irony, despite the fact that this tradition has taken Socrates as its launch pad and that Socrates is usually considered to be the paradigm of the ironic life. Instead, the concept of irony has been relegated to literary theorists to sort out (with varying degrees of success). Bernstein wants to recapture the importance of irony for philosophy. Second, Bernstein also wants to revitalize what has become a neglected alternative view of what philosophy is all about. There are two traditions of philosophy that run generally parallel to each other but that occasionally intersect and more frequently diverge. The first, and today the much more common, tradition holds that philosophy is an intellectual pursuit which has as its aim ‘getting things right’ and attempting to justify claims with reasons and arguments. (12) The second tradition, whose origin is at least as old as the first if not older, views philosophy as a practice, indeed, as a way of life. However, the idea of philosophy as a guide for living is roundly rejected in academic settings. We philosophy professors don’t do ‘self-help.’ Bernstein, while not abandoning philosophy in the first sense, would like to recapture the connection between philosophical pursuits and the living of a human life. And, for him, irony is the key to this connection. To attain his ends, Bernstein keeps his focus narrow. He does not deal in any significant way with the less philosophical, more literary investigations of the history and concept of irony. In broad outline, Bernstein considers the ideas concerning irony that are found in the thought of Jonathan Lear and Richard Rorty, two contemporary philosophers who see a central role for the concept of irony. Bernstein also examines the views of Alexander Nehamas and Gregory Vlastos, two specialists in ancient philosophy who have quite different views on the meaning of Socratic irony. And, tying this all together, Bernstein examines Kierkegaard’s concept of irony, which provides Bernstein with his fulcrum. According to Kierkegaard: ‘a life worthy of being called human begins with irony.’ (79, 80, 81, 88, and elsewhere) To explain the meaning of this is the ultimate challenge of the book. Bernstein begins with Lear’s working out of Kierkegaard’s dictum, ‘To become human … does not come that easily.’ (16) For Kierkegaard, human life is a task. One must become who one is and must (attempt to) do so authentically. In the context of this effort lies a tension between pretense and the aspiration embedded in that pretense. The classic example for Kierkegaard is the Christian. One has the pretense of being a Christian, but does one live up to the aspiration that being a Christian entails? As Lear understands it, the pretense is inextricably shaped by social structures and practices and generally by what an existentialist would call facticity. The pretense both does and does not capture the aspiration. Or, in a more Platonic way of putting it, the actual expression or manifestation of the aspiration (i.e., the pretense) does not and maybe cannot measure up to its ideal. Thus a gap opens between the pretense and the aspiration, and therein lies the possibility for irony. But that possibility does not automatically result in the experience of irony. It may well be the occasion for non-ironic reflection regarding the aspiration. A person may question whether his actions have truly been just or whether she has lived up to her Christian (or communist or whatever) commitments. The experience of irony is something other, something uncanny (following Freud, although a sense of this experience might also be enriched by reference to Heidegger). Lear gives as an illustration his experience as a teacher with grading. The question arises of exactly what grading has to do with his being a teacher, with education? That question might pose itself non-ironically: ‘Am I being fair as a grader? Have I developed assessments that capture the competencies this course hopes to instill?’ But Lear says one could fall into a vertiginous sense of radical uncertainty about the aspirational implications of teaching or education as such. ‘What am I doing here? What is the true nature of education anyway? Who am I, as a teacher?’ In such experiences, as Augustine would put it, I become a question to myself. To be clear, ‘ironic disruption’ (19) is not some kind of nervous breakdown, but rather is fueled by a sense of longing, it ‘manifests a passion in a certain direction.’ It hinges on a certain fidelity (20) to the aspiration, even as that aspiration has taken on an uncanniness. The ironic experience is shot through with care and significance. In a trope that recurs in the book, Bernstein, following Lear, says to think about the two levels of questioning here as falling into two ‘columns.’ The ‘left-hand column’ consists of questions aimed at reducing the gap between pretense and aspiration. The ‘right-hand column’ consists of questions arising from the uncanny, yet faithful, ironic disruption of the aspirations themselves – and oneself along with them. Bernstein notes that Lear criticizes Rorty’s understanding of irony as having no sense of the right-hand column sorts of issues. But Bernstein responds that Rorty’s own biography counters the criticism, i.e., that Rorty’s professional life raises just the sort of aspirational disruption in the field of philosophy that Lear encourages. Rorty manifests this not by abandoning philosophy but by redescribing it. Rorty, unlike Lear, attempts to say in so many words what he means by ‘irony.’ In his Contingency, Irony, and Solidarity, Rorty notes, ‘I use “ironist” to name the sort of person who faces up to the contingency of his or her own most central beliefs and desires – someone sufficiently historicist and nominalist to have abandoned the idea that those central beliefs and desires refer back to something beyond the reach of time and chance.’ One can thereby see the difference from Lear’s notion of what an ironic experience might be. For Lear, the `gap’ between pretense and aspiration implies that there is, indeed, something that human life is supposed to be like. For Rorty, this is too `metaphysical.’ Rorty’s ideal citizen would be the `liberal ironist,’ one who accepts the contingency of one’s own `final vocabulary’ (i.e., the foundational ideas used to justify thought and action but which themselves have no non-circular justifications) and who thinks `that cruelty is the worst thing that we do.’ (31) Rorty understands that `most ironists have not been liberals, and most liberals have certainly not been ironists,’ meaning that ironists have a tendency to be cruel (anti-liberal) in their take-downs of received opinions, institutions, and traditions, and that most liberals tend to think their final vocabularies happen to be the capital-T truth to which all must bow down under pain of irrationalism (i.e., they are un-ironic). For the liberal ironist, one’s pretenses are held securely, yet lightly, as one’s aspirations are best thought of in terms of hopes rather than Platonic ideals. The chief criticism of this form of ironic stance is that it relativistic, even nihilistic. If no final vocabulary has any more foundation or justification than another, then why prefer one over another? Or, to put it more bluntly: why not be cruel? (33) Rorty’s point is that waiting for a rational justification based on neutral standards or criteria is to wait in vain. At best we can make alternatives `look bad’ and open up new possibilities for establishing solidarity. Rorty, in fact, delimits left-hand reflection, even as he is `deflationary’ (115) with regard to aspirations. Bernstein’s main criticism of Lear is that it is difficult to tell what it would mean to `develop an ear’ for irony, to enlarge one’s `capacity’ for irony. His main criticism of Rorty is that there is not a sharp distinction to be drawn between rational legitimation and `redescription,’ and that Rorty makes endless use of argumentation throughout his work, thus calling into question just how one might really accept (I’d say, as an existential matter) the contingency of one’s aspirations. In a relatively brief second chapter, Bernstein tries to get a handle on the meaning of `Socratic irony’ by pitting against one another the interpretations of Socrates found in Gregory Vlastos and Alexander Nehamas (and also Charles Kahn). The key contrast is between a Socrates who knows what he means, but says the opposite to elicit specific effects (Vlastos) or a Socrates who remains a mystery, who is fundamentally undecideable both as a character and in terms of his meaning (about which he is ultimately silent). A third chapter on Kierkegaard ties irony to `ethical passion,’ that irony is `not the truth, but a way’ that does not foreclose on `a longing, an Eros, a passion that transforms us’ (99) as we struggle to become who we are. The book’s concluding chapter is a plea for the revitalization for philosophy of the question, `how should one live?’ and the important role irony can play in that quest. 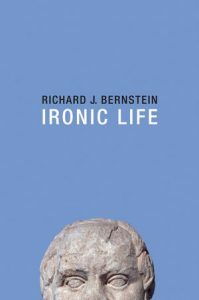 Despite Bernstein’s efforts, one comes away from the book still with very little idea of what irony is when it comes to living a human (a good human) life. I would argue that an opportunity was missed in Bernstein’s emphasis on Socratic irony rather than on Kierkegaard and subsequent existentialist reflection. The existentialists have a better handle on the `thing’ that the ironist-proponents are trying to grapple with. A more nuanced understanding of the difficult imperative of making a self comes from early Heidegger and the Marxism-informed later Sartre. Such thinkers might afford a better grasp of facticity to go along with the ambiguity of self-transcendence that Bernstein is talking about in the language of irony. One might thus argue that, as it stands, Bernstein’s approach remains a `bourgeois’ line of thinking, profoundly individualistic, with little reference to social solidarity as a key component of becoming who one is. I found this to be an extremely well written and accessible review that goes beyond review to tackle the subject matter of the book (which I have not read). I enjoyed it, it made me think, and I will bookmark it so I can return to it! High praise! I have no evidence that the bourgeoisie as a whole is not concerned with social solidarity (though parts of the bourgeois class aren’t, they are, as it were, Ayn Rand fans). I could provide plenty data for this view (the issues of social reponsibility, charitableness, legal obligation, social order and social cohesion etc.). The difference is more, in how people think, that social solidarity comes about (which can differ depending on what class you are in). The Left often blathers about “solidarity” without having a clue about what really brings it about, or what makes it disintegrate. In that respect, they are analytically often just as bad as the elites. The question about the ironic is about how you go about coping with the “unintended effects of intentional action”, and whether you can stick with your intention, despite unintended effects. If things don’t work out like you expected, you could respond in different ways. You could say, that “I must have been profoundly wrong”, but you could also say, “I just neglected some important aspects of the situation, but my intention was sound, and I can try something different to reach the same goal, with more success.” You could be wrong or right about that, of course. When e.g. Isaac Deutscher wrote about the “Ironies of history”, he was (I think) in good part, engaging in apologetics. He was on much more solid ground, when he acknowledged (as he did) that a revolution creates something wholly new, that contains both progress and regress, in ways which were unanticipated and unforeseen at the start. And people have to live on with the consequences. This presents a very difficult problem for moralists and emotive politicians and academics, who like to bracket things definitely and tidily as either “all good” or “all bad”. Yet the subjective experience of the ironic has, as its correlate, an objective chain of events, which followed a certain logic or law-governed dynamic. Different options could have been chosen, yes, but if they weren’t, that was for reasons which seemed compelling at the time. People were prepared to support certaim leaders, even if they secretly disliked them, because they judged that there was no other way available. From this point of view, the awareness of the ironic is not an answer or a solution, but instead an invitation to grasp why intentional action reached unintended effects, or why things happened in the way that they did and not otherwise. In that case, we are not mythologizing the past into a palatable or attractive narrative, but instead explaining it with facts and logic, so that we can genuinely learn from the experience. Spinoza remarked, “not to laugh or to cry, but to understand”. Nowadays we would more likely say, it is okay to laugh and cry, but let’s not mix that up with an objective, truthful and scientific understanding of what really happened.” Laugh or cry as you might, but get over it, and think. There exists an accessible “types of irony” page here: http://typesofirony.com/ but what is left out is (1) the distinction between comic irony, tragic irony, and tragicomic irony, and (2) the ways in which verbal, dramatic and situational irony are connected. For example, Trotsky remarked once, that the more social contradictions there are in civil life, the more people begin to tell lies, to patch over the contradictions. Formally, people are supposed to do something in a certain way (according to rules, norms, morals and laws), but informally and practically they cannot do so anymore – they are compelled to do something else, and then they have to cook up some “story”, to make it look like things were done the proper way. Similarly, plenty uses of the ironic mode arise out of situations where people are faced with effects to what they do, that they never intended, or which are the contrary of what they intended or wished. The basic thought here is, that the contradictions in thought are often triggered by the contradictions that exist in external reality. Thus, when people experience the irony of events, they have a subjective reaction to it, which acknowledges a deviation or inversion of the previously expected result. The existential dilemma is expressed as, or implies, a logical conundrum. So, the contradictions in real life are expressed in different forms, and one of those forms is (the varieties of) irony. However, since (as Engels says) the ideologists deal only with thought material, which is the end-result of the log of experience, they can confront a thought only with another thought, and are largely oblivious of the specific real situation that is the original source of the thought. In the ideological imagination, the real existential contradictions which produce ironization are obscured, or are represented in a distorted, mystical or unrealistic manner. Consequently, while the ideologists can grasp some of the ironic aspects of a situation, they really fail to grasp the real or true irony of the situation. It all remains rather superficial.